A certain Kind of narrative has chased MSG Films, right from the first film when it sent the censor board crashing out of the window. The die-hard MSG Fans create an infectious din that catches you off guard. The film has its share of foibles but on the whole, it is an action packed flick. It tugs at the heart strings of the Indian inside you and shakes you to the core. For the cold blooded and wanton killers from across the border, will a one time surgical strike do? This movie certainly answers the question and that is where things take off. The Indian Super Agent Sher-E-Hind is tasked with the mission of fixing our nasty neighbors who strike again after the first surgical strike. The casting director has done a great job finding Indian lookalikes of known Pakistani villains. The actors have performed creditably despite their lack of experience, thanks to pushy direction from the father-daughter duo. Some people used to laugh at the mass adulation chasing Rajnikanth and look at where he is today, laughing all the way to the bank!! So, we can quite safely disregard manufactured media opinion and say that MSG films have climbed several notches higher and are a serious threat to mainstream fare. For one simple reason, originality and creativity!! And the detail is nicely falling into place thanks to their emphasis on home grown talent. If one looks at MSG’s lover-boy avatar, it certainly catches you with its youthful earnestness. He impresses in the romantic scenes, the action ones and excels with his mastery of accents. One particularly hilarious moment is when he acts as a Sindhi trader tackling a confused Indian NSA Ajit Doval’s alter ego. 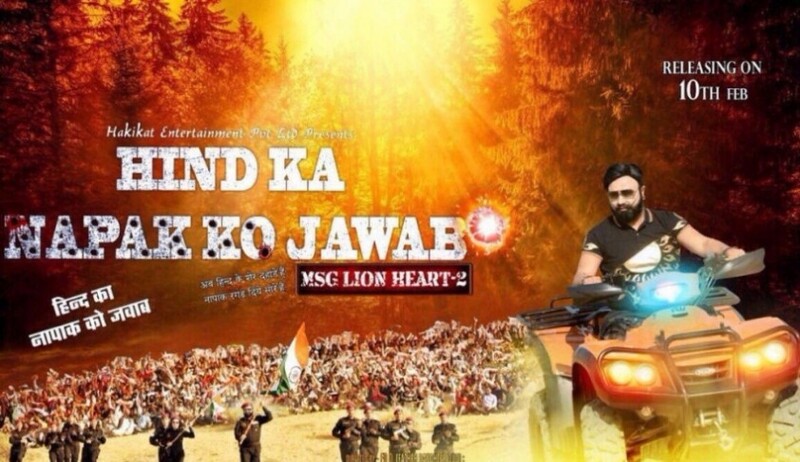 The film has its share of various kinds of masala: action, comedy and very, very strong music all united by the unifying thread of patriotism. Those who die defending our borders, their debts can never be repaid and this is a mighty tribute to the Indian army. The unknown actors reprising the roles of infamous real life NaPakis have performed convincingly, despite their inexperience. Honeypreet Insan matches her father at every step. Considering that she has worked behind the camera in a whopping 22 credits and also acted, it is a remarkable coming of age in what is only her second film. The film has come just in the nick of time, when a US based think tank has indicted Pakistan of a clear and undoubted role is being a creator, sponsor, exporter and advocate of terrorism. And there is a ring of absolute truth because one of the author’s of that report is Husain Haqqani, Pakistan’s former ambassador to the US. It is also a very bold statement from a Pakistani national which meets a resounding echo in this film. No one has dared to take the half truths dished out by terror master minds to lure youngsters as has MSG. This film strikes very boldly at the very roots of the ideology of terror, the allegedly religious angle. And very-very subtly it upsets the apple cart of Love Jihadists by portraying a Pakistani beauty drooling over an Indian hunk. Overall, One cannot help but admire the directors strong take on the issue, who have not only bashed NaPakis but also their Indian supporters, who questioned surgical strikes. Shot in very scenic locales, action, romance and music remain the strong points. 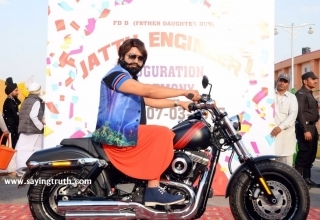 We predict a hit with good collections by this Gurmeet Ram Rahim aka MSG starrer at the Bollywood Box Office. Next article Beware! Save your children..It’s a drug and not a candy..